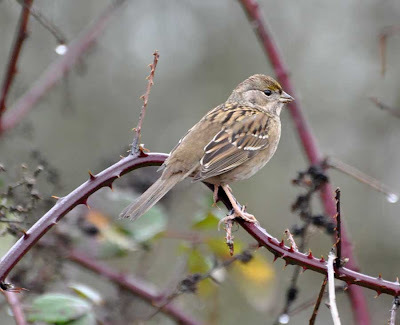 My original, admittedly lofty, goal was to see 100 bird species in the month of January. After sitting at 84 for a while as the days of the month tick down, it was clear I wasn't going to reach that, but maybe I could still break 90? 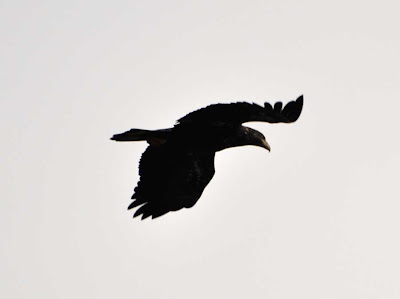 Today I got a chance to pursue a few recent bird sightings outside of the city. First up was to try and track down some western bluebirds my dad saw near his office a couple of days ago, but no luck there. 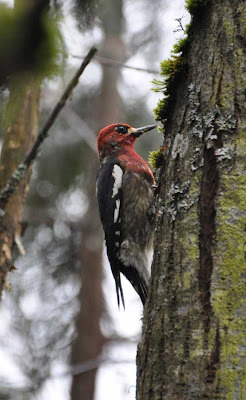 Then it was off to Carlton, Oregon to try and see Lewis's woodpeckers. Success! Right at the exact oak grove where several birders have recently reported Lewis's woodpeckers, I added year bird 85, and, more excitingly, another life bird for me! It only took a moment after stepping out of the car before spotting the floppy wingbeats of this bizarre woodpecker named after Meriwether Lewis of Lewis and Clark. 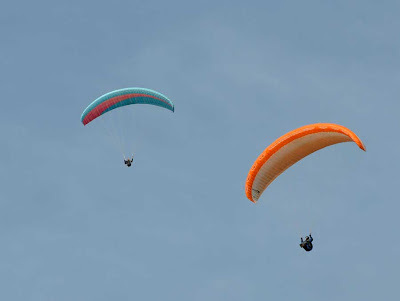 There were several of them flying around, and I got some decent looks that revealed their forest green backs and heads, gray napes, pinkish breast, and red cheeks. Sound strange-looking? It kind of is! They were too far away for photos but its worth checking out the photo on their Wikipedia article if you haven't seen them before. Old-time birders remember the days when the Lewis's woodpecker was common here in the Willamette Valley, but the fact that I've grown up here and never seen the species until today tells you how much that has changed. Next stop was Gaston, Oregon where a rare hooded oriole was picked up the day of our Forest Grove Christmas Bird Count. No luck there, so it was on to Pacific University campus where there is a resident colony of the clownish acorn woodpeckers (86). They store shelled acorns in caches in trees to feed on during the winter, and there were a couple flitting about the tree tops. The Lewis's woodpecker is bizarre, but the acorn woodpecker is comical, with its white eyes and black and white face. Again, too far for pictures from me, but here's a good one. Fernhill Wetlands yielded the last year bird of the day - the killdeer (87). It's amazing that it's taken this long to see one, and also that it's the first shorebird on the year list! Overall, a pleasant day's birding, with 43 species sighted, but nothing else unexpected was seen. 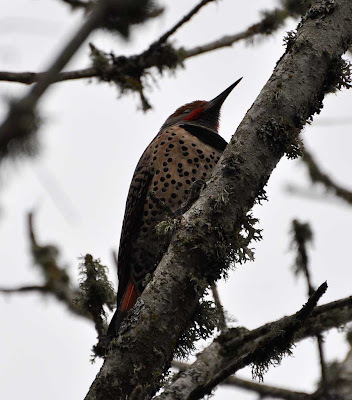 The sighting of a northern flicker made it a three woodpecker species day, never a bad thing! The highlight was of by far the life bird, the Lewis's woodpecker. Sorry for another post with no photos - it was gloomy and the birds were all pretty distant today. 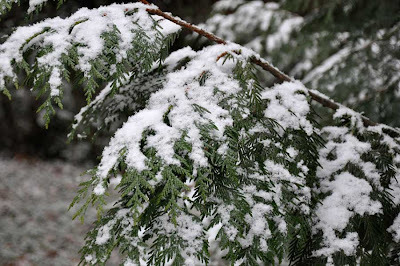 It seems a lot of bloggers have been having that issue during the gray days of January! I'll see if I can't find something photo-worthy this week. Since I've been back in Portland I've been pondering what's going on with local squirrel populations. 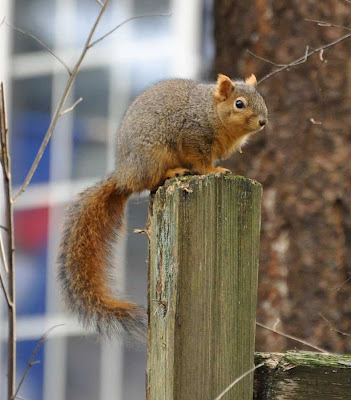 As long as I can remember, I've noticed two main squirrel species in the area: the introduced eastern fox squirrel (by far the most common) and the smaller, native Douglas squirrel. Both are reddish-brown squirrels. In recent months, I've also noticed an increased number of gray squirrels in the Portland area. This of course gets the naturalist in me wondering, and I've been trying to figure out what type of squirrels these are and where they've come from. There are two main possibilities: the eastern gray squirrel and the western gray squirrel. The western gray squirrel is native to the region but is described as having dramatically reduced populations in the region. 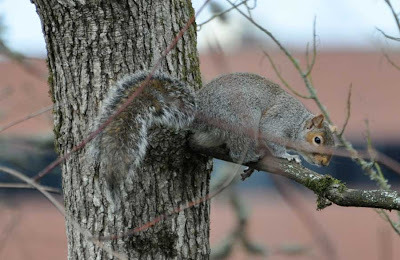 The eastern gray squirrel has been introduced to the west, and the Audubon Society states that they have been established in Vancouver, WA for over a decade and have recently been expanding into the Portland area. After looking at images of both species in field guides and online I have to say they look pretty similar, though the eastern gray squirrel is described as being significantly smaller than the western gray squirrel. My tentative conclusion is that I've been seeing eastern gray squirrels. My main reasons for this are the fact that they don't seem very skittish, as the western gray squirrel is described, and the amount of red the permeates their otherwise silvery-gray fur. I'm going to continue looking into the squirrel species distributions in Portland, but if anyone has any insight or knowledge about differentiating between eastern/western gray squirrels, your thoughts would be much appreciated! After a great day of birding on Saturday (42 species, 10 year birds, 1 life bird!) 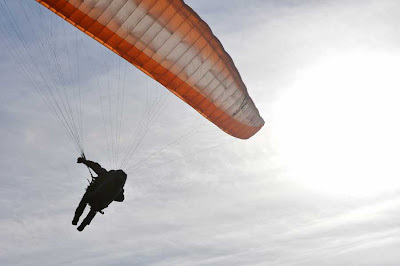 I was tempted to get out again on Sunday even though the rainy weather had returned. 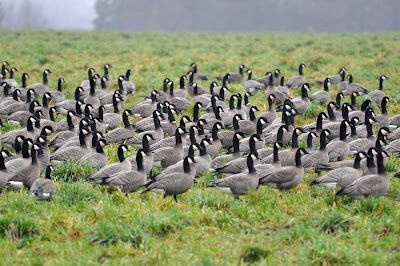 Sauvie Island was the destination based on recent reports of Snow and Ross' geese, both of which would be new to the year list. The rain didn't let up one bit all afternoon, but the birding was still pretty good regardless. Once of the first birds spotted was a merlin (81), the first of five raptor species on the day as I also saw American kestrels, bald eagles, red-tailed hawks, and yet another peregrine falcon. 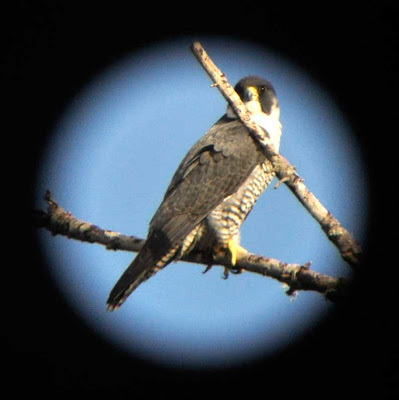 I can't believe I've seen three falcons already this year! The snow geese (82) were spotted where expected, but they were too far way to pick out any Ross' geese among them. There were lots of cackling geese and Canada geese mixed in nearby, however, including many dusky Canada geese. 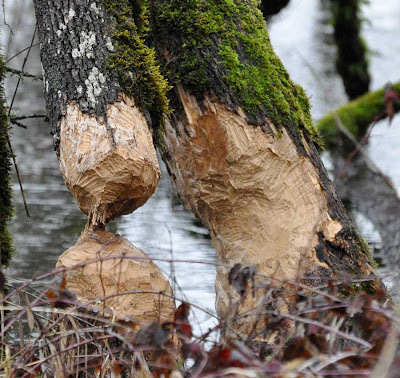 You may recall duskies are a relatively rare sub-species that overwinter here in the Willamette Valley. At least three of the birds we saw had red tags around their necks, too. The other main highlight of the 29 species seen on the day was the surprisingly elusive mourning dove (83) - definitely would have expected those sooner on the year list - and, a little more unexpected, a couple of Eurasian collared-doves (84). Some have predicted the Eurasian collared-doves will be the next European starling; in other words, a massively invasive species here in the United States. I hope not! 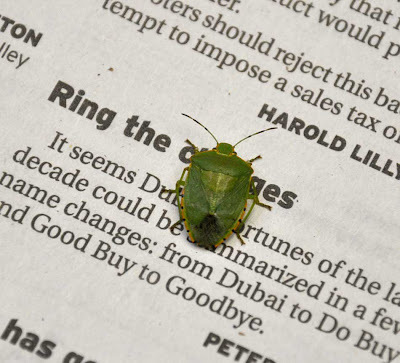 They are definitely spreading as new county records are occurring all over the Pacific Northwest. It will be interested to see what happens. 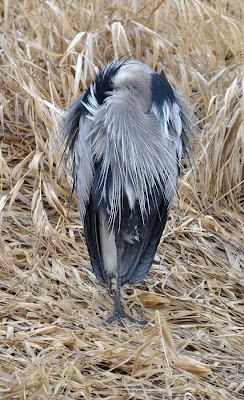 Sorry, no photos from the Sauvie Island trip....it was way too rainy and gray to pull the camera out, and all the birds were pretty far away too. There have been a few sun breaks in the last couple of days so hopefully well get another sunny day here before too long. Today turned out to be a great day's birding at the Oregon Coast. The weather report had looked somewhat iffy as far as rain, but it held off and was sunny for most of the afternoon. 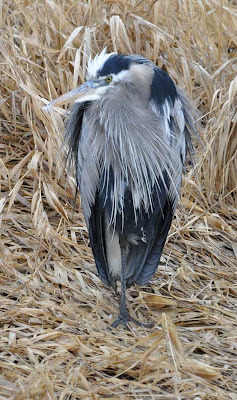 Additionally, this birder is on a limited walking regimen for the next few weeks after fracturing a bone in her foot during Thursday night's hockey game (ouch! ), so I was a little worried about covering ground, so today ended up being a nice mostly-driving tour of Tillamook county. A couple of other birders stopped while we had the scope on the falcon, and it turned out to be Max from The Apartment Biologist with his wife. Funny to run into other bloggers in the field like that! They were also interested in spotting the snowy owl that has been seen on Netarts Spit of late, but we took two good scans of the peninsula and couldn't find it. There were hundreds of harbor seals hanging out on a sand bar, though! By then, the sun was starting to get low in the sky, but we decided to end the birding at Fenk Road which heads out into the field between a creek and a couple of farms. 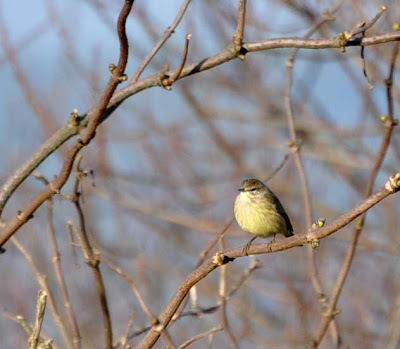 It turned out to be a birding hot spot, adding several species to the daylist such as gadwall and white-crowned and golden-crowned sparrows. 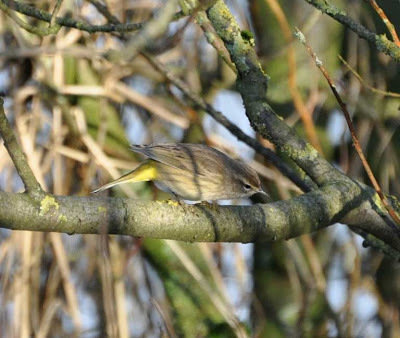 It also yielded the highlight of the day, a life bird, a palm warbler!! The other day I chased after a report of a Eurasian green-winged teal (also known as the common teal) at a local city park. 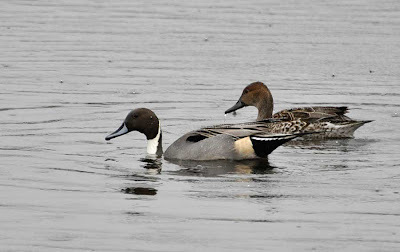 Maybe it's a good thing I didn't find it, because then I would have had to decide whether or not to count it as a separate species from the American green-winged teal on the year list, an issue that is still hotly debated. Even without the Eurasian teal sighting, I was amazed at how many different species were using the relatively small park right in the middle of the bustling suburbs. 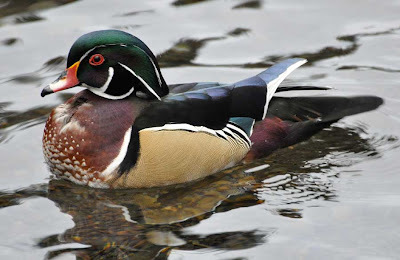 All in all I saw 21 species there, including eight species of waterfowl. Sorry all the pictures are practically just silhouettes today - that gives you an idea of the dreary gray weather we've been having! No new year birds were added to the list during the visit to this city park, but yesterday a walk around the neighborhood did yield a couple chestnut-backed chickadees (70). It looks like there is a clearing in the weather forecasted for this weekend so the plan is to head to the coast, where I should definitely be able to boost the year count while conducting another beached bird survey. Don't worry - only the live species observed will be counted on the year list! Rain, rain, and more rain! 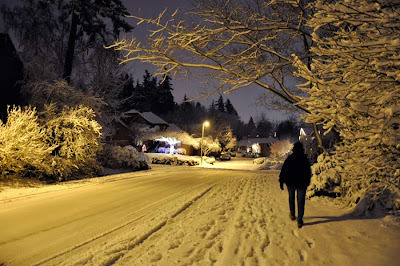 That's what we've had here in the Portland area for the last week. 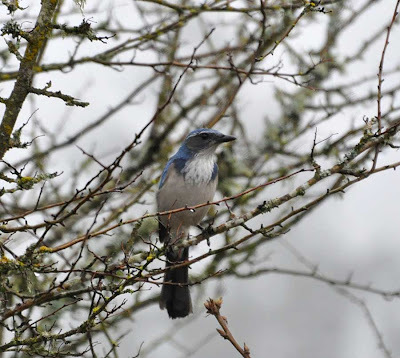 While the temperatures have been fairly mild (mostly around a warmish 50 degrees), the damp weather has limited the birding excursions a little bit as its nicer to bird from the car than hike too far in the wet. 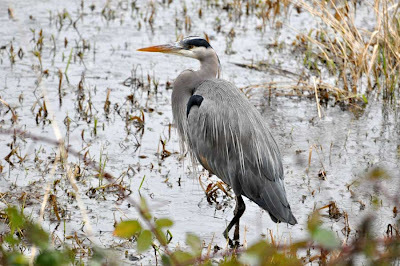 This weekend, the perfect place to go birding was thus Ridgefield National Wildlife Refuge. It's in southwest Washington about 15 miles north of the Oregon border, and includes a spectacular auto tour route that is one of my all-time favorite places to bird. Over the course of a couple hours my dad and I spotted a respectable 46 species in the refuge and while driving the surrounding country roads. 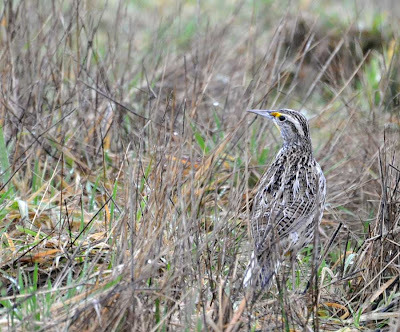 Six of those species were new for the year list: herring gull, rough-legged hawk, sandhill crane, western meadowlark, northern harrier, and white-crowned sparrow. The rough-legged hawk was probably the coolest of the bunch, being a fairly rare sighting for this birder. Altogether the year list now stands at 69. As soon as they turn around, however, there's no missing them with that bright yellow front and black bib. 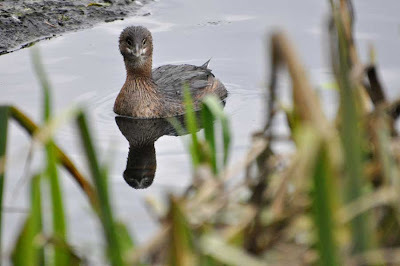 These guys are the Oregon state bird, though since their numbers have declined significantly they aren't seen nearly as often as they used to be. It was an unexpectedly great day of birding given the weather! "Gulls - a word of inherent paradox. Almost anyone can recognize a gull - or "seagull" - as such, but to identify certain gulls to a species can vex the most experienced observers. Gull identification offers something for everyone - form studying the different plumages of Laughing Gulls at a beach parking lot to puzzling over winter flocks of large gulls at a river mouth or reservoir. You can take identification to any level you choose, and there's still an unknown, a new frontier, another question to be answered. That's what makes gulls so much fun." 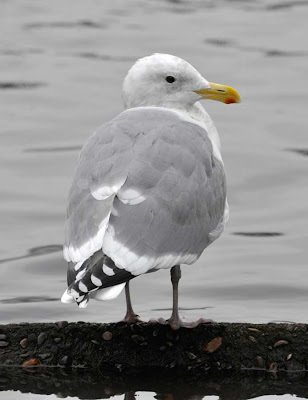 Gulls can be difficult enough to identify as purebred adults, but add in all the cycles they go through before they reach adulthood and all the hybridization that occurs and distinguishing one species from another becomes downright complicated. I knew this already, but it was reinforced by spending time with gull field guides and the varying answers I received on the quiz both in the comments on my last blog post and in the several e-mail answers people sent me. Thanks to everyone who responded, particularly the ace birders who gave some great insight into how to ID gulls. 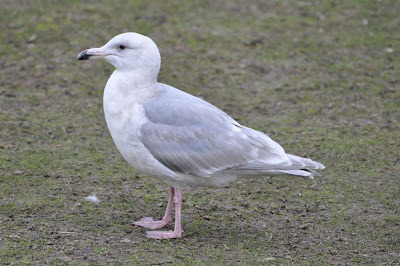 The only thing everyone agreed on was that the gull in photo #3 (click on the images or refer to the previous post to see larger photos) was a glaucous-winged gull. The pale gray wingtips and dark eye are key field marks for this species. 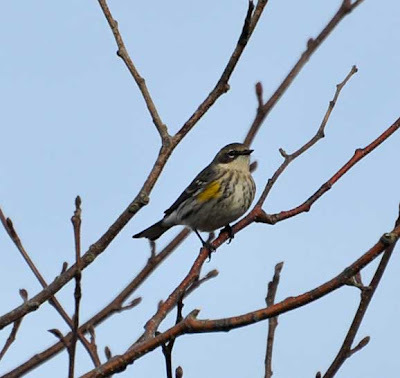 Most also pegged it as a third winter bird, which is where I placed it as well. 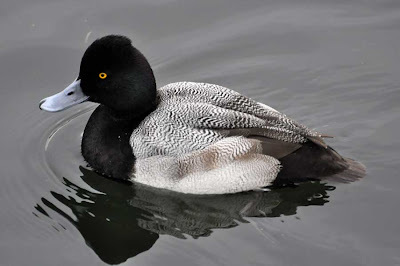 While the plumage is fairly clean, this one is clearly not yet in adult in part because of the black tip to the beak, since adults have a red spot on the bill. For the bird in photo #2, several people guessed it was an adult Thayer's gull, and others an adult western gull, but I concluded it was an adult Western x Glaucous-winged hybrid. 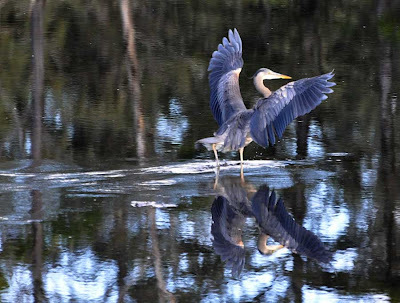 The legs are actually relatively pale (Thayer's have deep pink legs) and appear a bit darker in the photo because they are cast in the shadow of the bird. 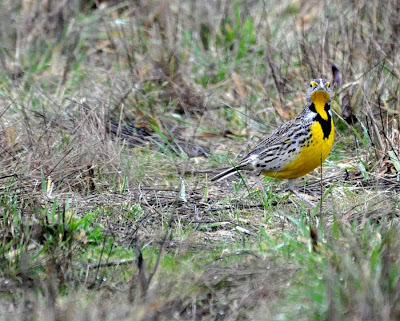 As Greg pointed out, the bill is fairly stout, which also points away from the Thayer's which has a smaller bill that's more yellow-green than yellow-orange in color....or so the field guides tell me! There are many paler western gulls, but the fact that the mantle is light combined with the dark (but not quite black) wing tips led me to conclude this was a hybrid with the glaucous-winged gull. The western x glaucous-winged hybrid is very common in the Pacific Northwest. 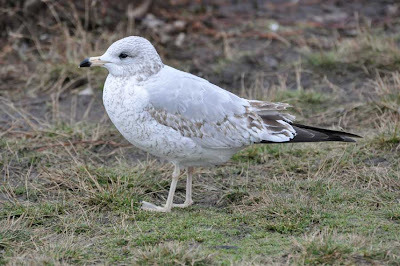 Everyone knew this wasn't an adult bird, but the species suggestions ranged from Thayer's gull to mew gull to ring-billed gull. I had concluded this was a first winter ring-billed gull, an identification helped, I admit, by the fact that there were many adult ring-billed gulls around and no mew gulls when the photo was taken. I didn't know to look for the "dark anchors" as pointed out by Greg and Dave - they're referring to the dark centers on the feathers in the brownish wing coverts, which are uniformly pale brown on the immature mew gulls. I definitely learned a lot more about the nuances of gull identification with this little quiz, and I hope you did too. I think it's an experiment that bears repeating sometime in the future with some new gull photos! 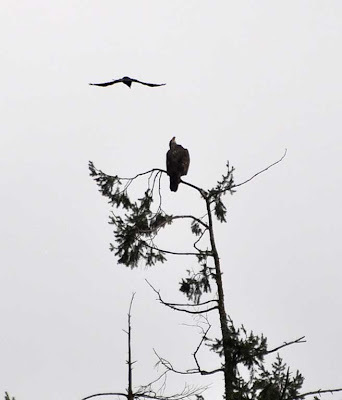 I've added four species to the year list in the last couple of days, the most exciting of which was a peregrine falcon at Jackson Bottom Wetlands on Tuesday. It's been raining for days straight but there seems to be a break in the weather today so I'll get out there and see what I can find. In the meantime, here is a short gull ID quiz. It may not be too difficult for some of you, but it's also a quiz of my ability to correctly ID gulls (I'm pretty certain I have all three of these correct), so I'll be very interested in your answers. I'll post my answers in the comments section in a couple of days. No more outdoor ice skating at Westmoreland Park, which means it has returned to being a winter birding hotspot. Someone had reported a Eurasian wigeon there a couple days ago, so yesterday I decided to head out to try and find it. 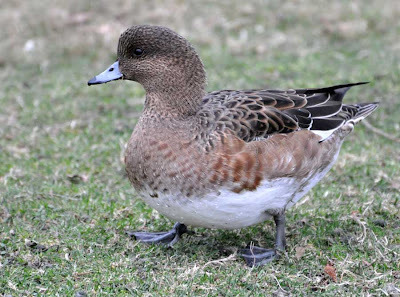 It wasn't until I reread the sighting report a little more carefully that I realized it was a single female Eurasian wigeon, which was going to make the task of finding it a little tougher. 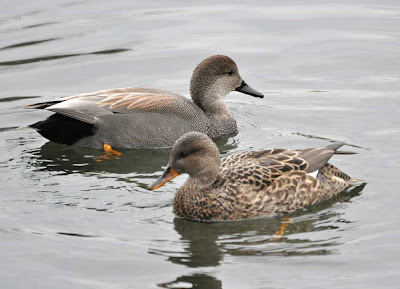 Female ducks aren't nearly as difficult as immature gulls, but they are not my specialty! 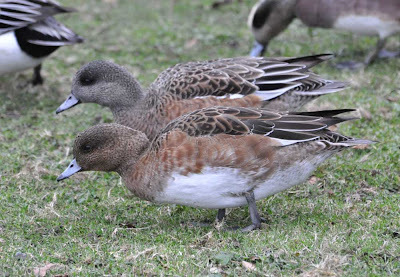 So, I consulted the Sibley's on the nuances of female wigeon identification and off I went. 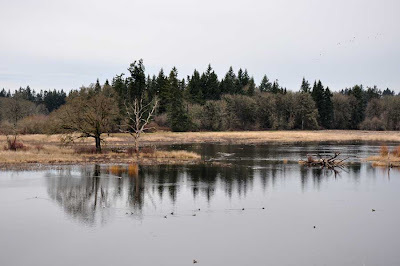 With a break in the rain yesterday it was a nice time to go out birding, so my dad and I went to see what was happening at Tualatin River National Wildlife Refuge. Turns out we weren't the only ones with the same idea....the parking lot was packed! 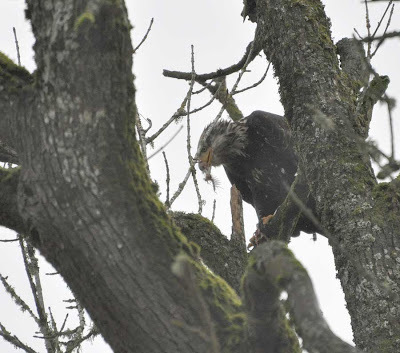 I wonder if people were inspired by the article in The Oregonian over the weekend that featured winter birding in the Portland area. Also, I've decided that when I don't get out birding anywhere else I'll at least try to walk Moonshadow Park, the little path in the neighborhood that I mentioned in the last post, where I saw the red-breasted sapsucker. I added a list in the side bar to the right where I'll keep track of how many different species I've seen there on my visits, so keep an eye on that over the next few months. I started out walking at a local park where I saw a lot of the usual suspects but was pleased to see numerous northern flickers and downy woodpeckers. The other real unexpected highlight was a pair of lesser goldfinches. It really started to rain by the end of the walk so I stayed in the car to view Koll Center Wetlands. 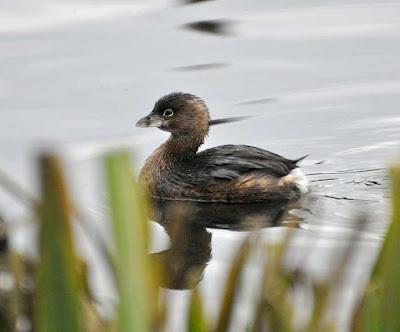 There were surprisingly few ducks on the lake, and aside from the American coot and a pair of pied-billed grebes the only other bird of note was a group of eight ruddy ducks. 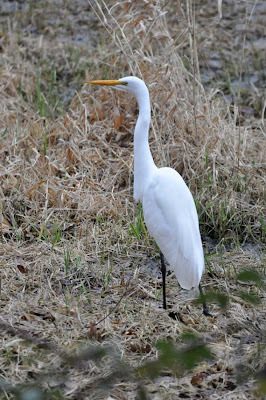 Neither the egret nor the heron seemed to be in hunting mode, and the only bird I saw that caught something was a common merganser that flew by with a squirming frog in its beak! When I got home it was still raining but I decided to check out one more short nature path that's in the neighborhood and it turned out to be well worth the wet. Right at the entrance to the trail was a red-breasted sapsucker being followed by an Anna's hummingbird. This is an association I've seen a couple of times before, including once in my parents' front yard, but it never ceases to amaze me. The Anna's hummingbird, which overwinters in the Pacific Northwest, obviously can't be sustaining itself on flower nectar this time of year. 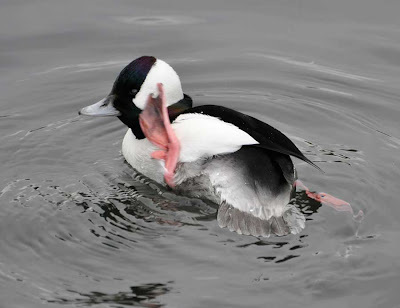 In addition to insects, it also follows sapsuckers around and then ducks in to drink the sap from holes the woodpecker has recently been working on. 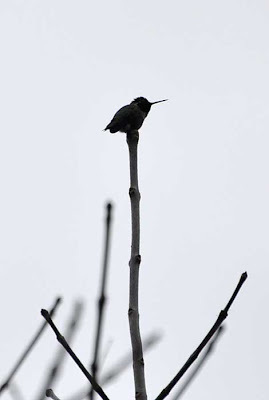 It's remarkable enough that the hummingbird survives the cold, but the woodpecker association is truly awesome. Unfortunately I had to dash back to the house for the camera (I didn't think I'd see much and didn't want to carry it in the rain - you think I'd have learned by now!) and when I got back the hummingbird had moved on. But luckily the woodpecker was still present. 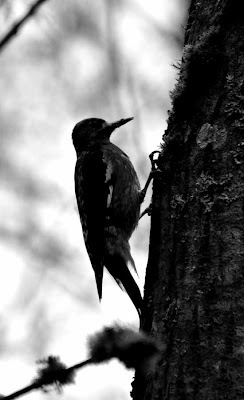 As I moved around to get a different angle the woodpecker ended up almost completely silhouetted against the gray skies, so I turned this image into a grayscale to enhance the effect. The only other bird I ended up seeing on the whole path was a single varied thrush. All the others must have been smartly tucked out of the rain, so I took a hint and went back home and did the same. I have three things of note to blog about, so I thought I would combine them all into one post. First, and most excitingly, there has been another new calf born to J-Pod! 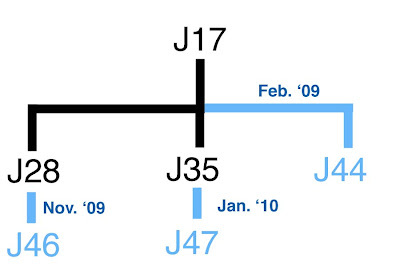 On January 3rd it was confirmed that J47 is a new calf born to young first-time mom J35 Talequah. This makes for six calves born in the last year (!!!) and no deaths (!!! ), so the Southern Resident population now stands at 88. You may recall that I was lucky enough to be on scene the very first time J46 was seen with mom J28 Polaris back in November. I can just imagine the excitement and mayhem of having three youngsters all in one family. I can't wait to see them next season! 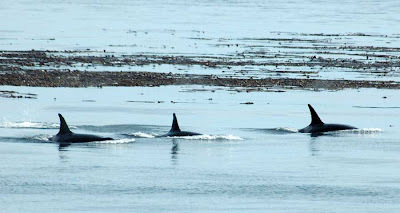 Secondly, I've posted before about the new proposed vessel regulations in response to the endangered listing of the Southern Resident orcas by sharing my opinion and my comments from the public meeting. NOAA extended the original deadline of the comment period to January 15th - so if you haven't yet submitting your comments this is your reminder that now is the time to do so! 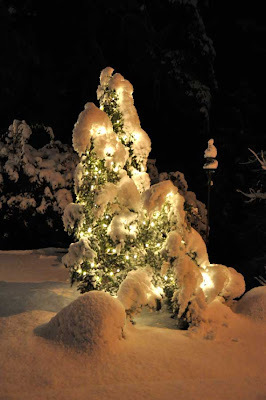 You can find all the relevant info from NOAA here. Finally, I wanted to share that my blog was honored on this list of Top 50 Marine Biology blogs. I blog for fun and to share my sightings and photos with others around the world with similar interests and passions, and it's always special to receive feedback (that's why I love your comments!) and recognition. So, let me just take this as an opportunity to say: thanks for reading! Western screech-owls are the only owl that I commonly hear (and occasionally see) in the Portland area. One year we had them nest in a tree right in our front yard. From the neighbor's second story window you could see one of the parents sitting in the entrance to the nest, and after the owlets fledged we watched them take their first flights, call back and forth to their parents in strange, screeching calls, and we had one reluctant flier sitting on our fence during for a couple of days. It made for some great photo ops (I'll see if I can't dig up those photos in the near future - that was back in my film days) and luckily it evaded any cats or other predators. Off and on throughout the year we can hear the characteristic rapid, whistle-like hoots from inside our house at night. 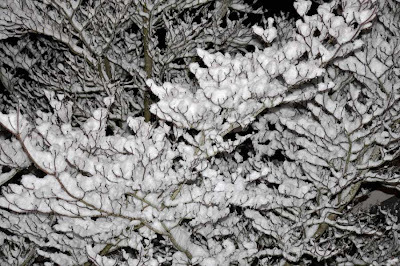 Tonight was one of those nights, and I stepped outside to get a better listen. Here is a little recording I made so you can hear them too. Sorry about the background noise - it was a bit windy/rainy out. I'm actually still hearing them now, about half an hour after I made the recording. 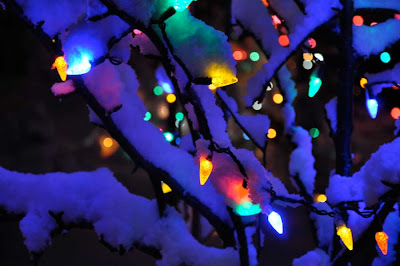 I was a little sad it didn't last a bit longer, but I'm glad we at least got some snow this year. 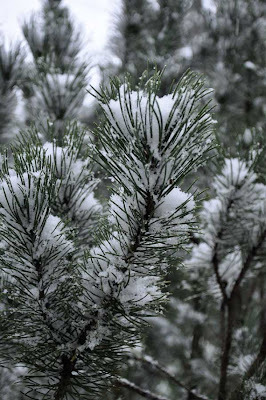 (You may remember last year we had an unusually long arctic blast, which made traveling to Portland tough, great bird-watching at the feeders, and a white Christmas!) Before the snow arrived I had some fun playing around with my camera and taking pictures of all the holiday lights, so I'll feature some of my abstract shots in my next post.